Is féidir tuismitheoirí le h-aon dalta atá 4 bliana d’aois foirm chláraithe a lorg le haghaidh daltaí ag tosnú ar scoil An Meán Fόmhair taréis a gceathrú breithlá. Is féidir le tuismitheoirí / caomhnόirí foirmeacha clárucháin a fháil díreach όn scoil nuair a bhuaileann tú isteach. Má tá tú ag clárú páiste agus ag lorg cruinniú leis an bpríomhoide ar an lá déan coinne roimh ré le do thoil. Glactar le clárú daltaí ag aistriú go Gaelscoil Faithleann ό scoileanna lán Ghaeilge agus Béarla ins na Naíonáin Bheaga, Naíonáin Mhόra, Rang 1 agus Rang 2. I gcás daltaí ag aistriú ό scoileanna lán Ghaeilge agus Béarla go Gaelscoil Faithleann ό Rang 3 ar aghaidh déanfar cinneadh mar gach aon iarratas bunaithe ar an gcás. Parents or guardians of all children who have reached the age of 4 years of age are welcome to apply to enrol their child/children to start at school for the September following their 4th birthday. Application forms for enrolling children can be obtained by calling in person to the school. If you are enrolling a child and wish to meet with the Principal on the day please arrange this meeting in advance, by phoning the secretary. Children transferring to Gaelscoil Faithleann from Irish or English medium Primary schools may apply to enrol at Gaelscoil Faithleann for Naíonáin bheaga (Junior Infants), Naíonáin Mhόra (Senior Infants), Rang 1( First class) and Rang 2 (Second class). If children are transferring to Gaelscoil Faithleann into classes from Rang 3 (Third class) upwards from Irish and English medium primary schools these applications will be reviewed on a case by case basis. 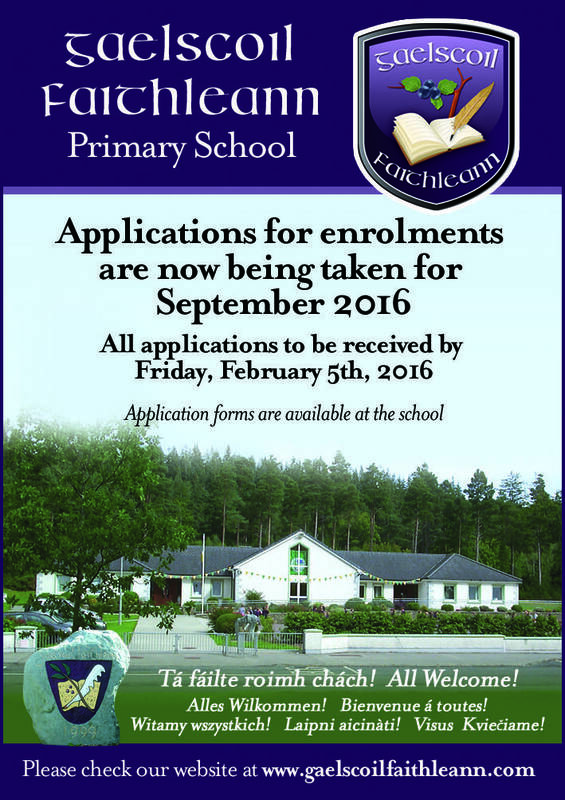 The full school enrolment policy is available at Gaelscoil Faithleann.